Are you sick of not having enough room in your garage to park your garage? 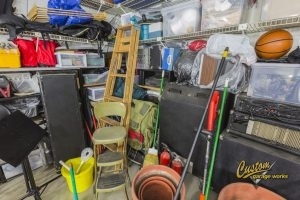 Has your garage just been another room to store stuff? This can be frustrating, but at Custom Garage Works we have the best solution for you. A great way to have space for your car and store your extra belongings is by getting overhead storage for your garage. Overhead garage storage is great and can really benefit you and your garage. Below are a couple of benefits to installing overhead storage. Make Your Garage Less Crowded with Overhead Storage! If your garage is becoming overcrowded, it could be tempting to rent a storage unit to store some of your things. However, with overhead garage, you don’t have to waste your money! All of your stuff can stay on your property but out of your way. Instead of buying wall storage that could extend onto your floor, why not get storage space that doesn’t have to be on the ground. With overhead garage storage, all of our extra belongings aren’t taking up any space on the floor. It might seem like a great pain to store your stuff in overhead shelving, but with the use of cables or crank you can easily lower or crank it back up. No need to get on a ladder and remove heavy items or boxes. If you think overhead garage storage in Dallas, TX would be something that could help reduce clutter in your garage, please call Custom Garage Works at 214-494-9068! Posted in Uncategorized on June 15, 2018 at 4:20 pm by Custom Garage Works.